I like to write about demons. Maybe it's my overall fascination with horror, my experiences with religion, or great appreciation for Supernatural (to be clear--it's a bad show but I still enjoy it), but I find that when I need to explain something such as inner turmoil, I like to draw upon demons. I wrote about the two demons I run with. Today, I'm going to talk about the two demons of the doctorate. My guess is that some of you are quite familiar with one and possibly familiar with the other. The doctorate program, like many other big tasks is dominated by output and deadlines. There's papers to be done throughout the courses leading up to the dissertation process and then more deadlines, bigger and more stressful deadlines along the way. I'm often challenged by deadlines. I think Douglas Adams, in all the ways he has influenced me, maybe have influenced me most when I heard him say, "I love deadlines. I like the whooshing sound they make as they fly by." (I "heard" him say this in one of his books that he narrated--I believe it was Mostly Harmless). So I have a problem with meeting deadlines in general (and am grateful for my faculty dealing with this failure of mine). But when there is no wiggle room for deadlines, I still find myself struggling to get it done in time. One reason is that I inevitably succumb to the siren song of the Distraction Demon. The Distraction Demon calls me to check my email one more time because who knows what happened in the last 5 minutes or the double check if anyone has interacted with my really pithy (not really) tweet that I just had to unleash 7 minutes ago (you know, 2 minutes before I last checked my email). Then, I also realize that I'm in dire need of more coffee so that I can get my mind into the game and that I also need to adjust my playlist or move to a different Pandora station or maybe I should just hand select 20 songs to power me through this next stretch. Many of us are familiar with the Distraction Demon. This demon finds its way into getting us to decide it is time to clean our apartment before we can do any writing or that we must play with the cat or do any of a bajillion things. When it comes to going down the path of the doctorate, the Distraction Demon pulls out all the stops and I am often feeling seduced. So how do I combat the demon--after all, they are pernicious little bastards, always popping up when you are most vulnerable, right? I have a few strategies. Seriously. By naming it the Distraction Demon, I've made it clear that I realize what is happening, externalized what is going on inside and cast it out. That's right, you name the demon and then exorcise it. It also helps because you to disconnect it from you. Occasionally, I'll ask a friend to call me out on staying focused. This doesn't happen as much but when I do it, I make sure that their calling me out comes with a price (e.g. I gotta give them $1 every time they catch me not doing what I'm supposed to do). When I'm really down to the line and I need maximum output but the Distraction Demon is hungry as all can be, I call upon the Pomodoro Technique. It's a pretty simple technique. I use an app on my phone but there are definitely other methods (such as just a timer). It works as such. You set the timer for 25 minutes. During those 25 minutes, you're solely focused on the task at hand. At the end of the 25 minutes, you get a 5 minute break (and must take it). On the 4th cycle, you take a 15 minute break. That's pretty simple but it does give one a great format to work through in order to successfully make progress. If slaying the Distraction Demon can happen, I find more trouble with the Creativity Demon who, while may be a cousin of the Distraction Demon, is still its own entity. There's a formulaic element to producing a dissertation: research, think, write, get feedback, think, adjust, integrate new research, think, write, get feedback...you get the gist, right? And it demands a lot of for my brain to focus and drive through a process that demands intellectual attention and rigor. It's not so much a struggle as it is, it requires a formality of thought, analysis, writing, format, etc. All of which leaves my creativity absent. Yes, some creativity appears in the ways in which I problem-solve or try to connect my ideas together but those are mere drips. So the Creativity Demon rears its head and that creates such a challenging tension. In general, I have many ideas about creative projects--usually centered around creative writing such as short stories and novels, but then also around blog series, free-writing, and such. However, through the duration of the program, it has often felt like my brain has come up with ALL THE IDEAS in different mediums and formats. The Creativity Demon is bouncing off the walls of my brains begging to be let out. 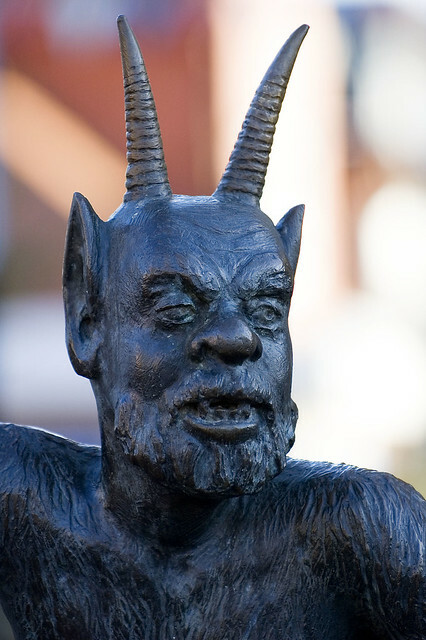 Unlike the Distraction Demon, I really like the Creativity Demon but its insistence on taking control can be quite problematic when what I need to do is to produce the next piece of my dissertation or shuffle through mounds of research. Unfortunately, while I'm totally fine with slaying the Distraction Demon, I'm not nearly as content to slay the Creativity Demon; I rather like this fella. But there are times, when he needs to be put aside or slightly abated. How do I manage that? These methods work with various effects. Mayhaps they work long enough for me to get the things I need to get done and for now, that's all I can do. Obvious for anyone who is creative, capturing your ideas and putting them down for later inspection is largely a given, but especially in a doctoral program, you're so used to writing notes and ideas related to research, that you might not make space (literal or metaphoical) for writing down these creative ideas, but do it. I always have a notebook onhand and have a specific area in my Google Keep for ideas. I've channeled some of my creativity into other areas--some of which is productive and some of which is just something I don't normally do. For the productivity, I've been more creative when cooking meals with my partners and our friends. I will experiment and go off the recipe a bit more to try ideas that make sense in my head. For being creative in ways that I usually am not, I've found that I will occassionally break into dance and just channel the creativity energy through my body. Now that, is something that is a bit strange for sure for me. I'm not much of a spontaneous dancer but when I'm alone (this might be when my partner finds out about it) and I have the music on, I will occasionally dance to just feel freedom of movement and engagement with the music to let my Creativity Demon out. To be clear, it's not anything worth watching, but it is something worth doing. 3. Seize my down times. Sometimes, there are down times that I take advantage of to put more heft to the creative ideas that I come up with. In between semesters or even when there's a bit of a lull. I plan for and seize these moments, knowing that they will necessary for me to move forward. Other times, I will pay the piper. I engage in the creative act and spend the time on it as I feel is necessary, recognizing that it will cost me, but also know that it will cost me more not to do it. I appreciate that I can do this and recognize that some of my ability to do this lies in having understanding and kind faculty and advisors who do not worry as much about timelines as they do about seeing progress overall. That's some of my strategies for distraction and creativity. What about the rest of you? What strategies can you share?